Home > Blogs > What is Pareto Analysis? Pareto Analysis is a statistical technique in decision-making used for the selection of a limited number of tasks that produce significant overall effect. It uses the Pareto Principle (also known as the 80/20 rule) the idea that by doing 20% of the work you can generate 80% of the benefit of doing the entire job. Take quality improvement, for example, a vast majority of problems (80%) are produced by a few key causes (20%). This technique is also called the vital few and the trivial many. In the late 1940s Romanian-born American engineer and management consultant, Joseph M. Juran suggested the principle and named it after Italian economist Vilfredo Pareto, who observed that 80% of income in Italy went to 20% of the population. Pareto later carried out surveys in some other countries and found to his surprise that a similar distribution applied. 80% of customer complaints arise from 20% of your products and services. 80% of delays in the schedule result from 20% of the possible causes of the delays. 20% of your products and services account for 80% of your profit. 20% of your sales force produces 80% of your company revenues. 20% of a systems defects cause 80% of its problems. The Pareto Principle has many applications in quality control. It is the basis for the Pareto diagram, one of the key tools used in total quality control and Six Sigma. In PMBOK, Pareto ordering is used to guide corrective action and to help the project team take steps to fix the problems that are causing the greatest number of defects first. Create a vertical bar chart with causes on the x-axis and count (number of occurrences) on the y-axis. Arrange the bar chart in descending order of cause importance that is, the cause with the highest count first. Calculate the cumulative count for each cause in descending order. Create a second y-axis with percentages descending in increments of 10 from 100% to 0%. Plot the cumulative count percentage of each cause on the x-axis. Join the points to form a curve. Draw a line at 80% on the y-axis running parallel to the x-axis. Then drop the line at the point of intersection with the curve on the x-axis. This point on the x-axis separates the important causes on the left (vital few) from the less important causes on the right (trivial many). 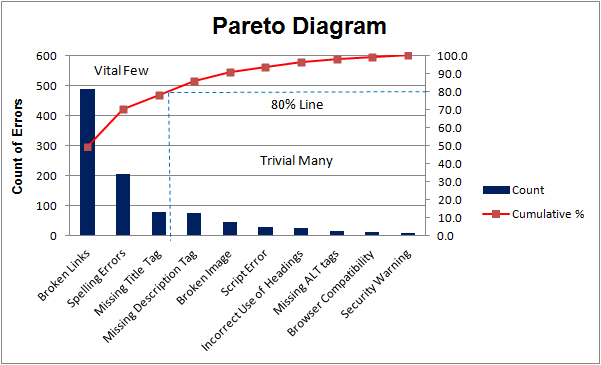 Here is a simple example of a Pareto diagram, using sample data showing the relative frequency of causes for errors on websites. It enables you to see what 20% of cases are causing 80% of the problems and where efforts should be focussed to achieve the greatest improvement. In this case, we can see that broken links, spelling errors and missing title tags should be the focus. The value of the Pareto Principle for a project manager is that it reminds you to focus on the 20% of things that matter. Of the things you do for your project, only 20% are crucial. That 20% produces 80% of your results. Identify, and focus on those things first, but don’t entirely ignore the remaining 80% of the causes. bookmarked to check out new material you post.